Hey guys, I’m still unpacking ALLTHETHINGS and waiting for internet to be installed, and even more importantly, MY STOVE! Emily is here to share an all new, completely addicting snack I know you’ll love. Thanks, Em! You’re the best! Hey Guys, it’s Emily from Jelly Toast! 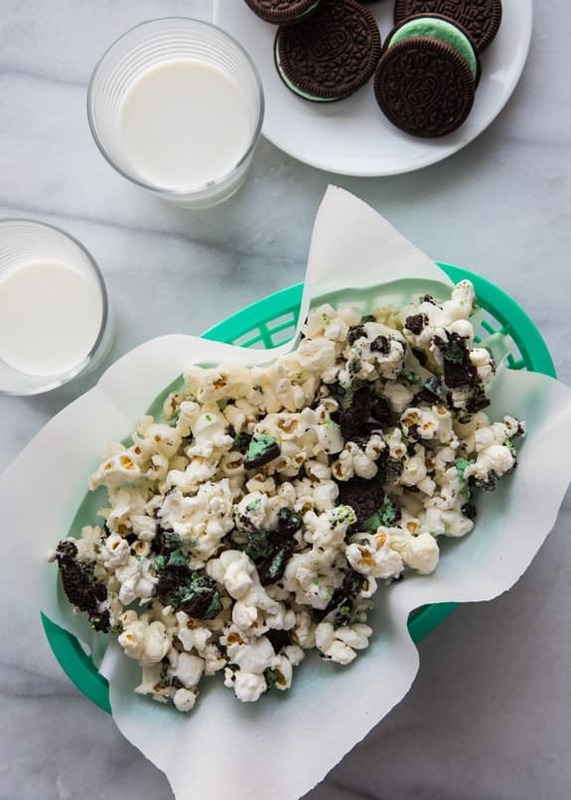 It’s been a while since I’ve been over here on MBA and I’m pumped to be here sharing this oh, so simple and delicious Mint Cookies and Cream Popcorn. While Jamie and Eric are busy packing and moving their family to their beautiful new home, I’m deep in the middle of a dessert popcorn love affair. I mean, what’s not to love? Fluffy air popped popcorn, white chocolate and crushed Oreos. Yeah, I’m into it. I am totally one of those people who goes a little nuts for seasonal and favored Oreos in the aisle of Target. If I’m being honest, it’s not just Oreos. Seasonal grocery aisles are my Achilles’ heel during what was supposed to be a quick trip to the store. Three hours later, I emerge dazed and loaded down with way too much holiday contraband. While mint Oreos are available year round, they always call to me around St. Patrick’s Day. Yes, I realize it’s still February, but eh, I’m going for it. Let’s dive into green goodness. When I think of St. Patrick’s Day, I usually focus on savory dishes like Beef Stew and Irish Beef and Vegetable Hand Pies. Pretty much anything that I can squeeze a bottle of Guinness into is totally my jam. The thing is, my kids like to have some treats around and having simple desserts that can be infused with a bit of holiday flair are what I love. 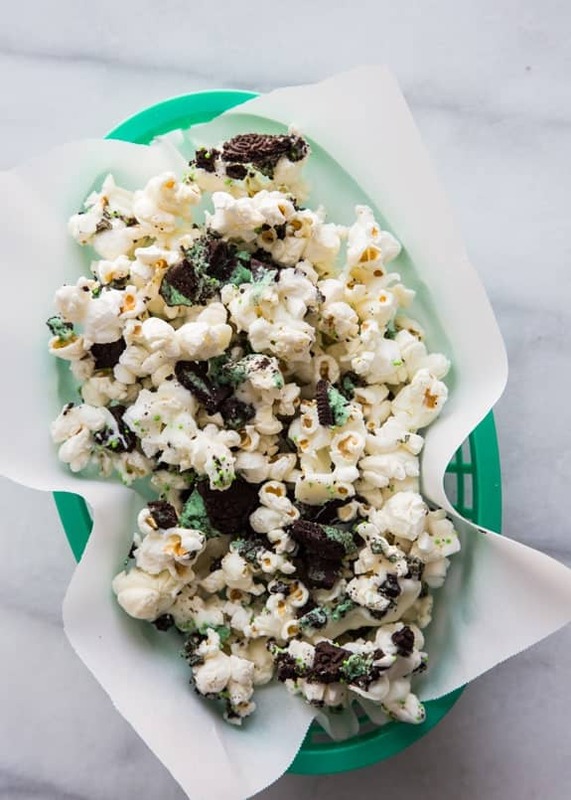 This Mint Cookies and Cream popcorn can be made for any holiday, just switch out the Oreos. 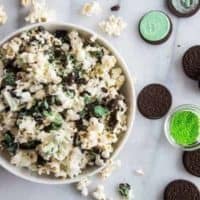 Want Spring Cookies and Cream Popcorn? Pick up a bag of the cute yellow filled Oreos and sprinkle with adorable pastel sprinkles. Plus, the recipe is all something that the kids can help make. My kiddos are fascinated with our air popper. They always wait for the last kernel to pop after the machine is turned off and then fall all over themselves laughing with delight. While the making of this treat is super simple, the eating of it is where the fun really is. It’s sweet, a touch salty and just plain delicious. Make a big bowl of this and pop in a movie, and you’ve got yourself the best movie night ever. Pop popcorn kernels in an air popper. Spread popped corn onto a rimmed baking sheet. Melt candy wafers in the microwave, following package directions. 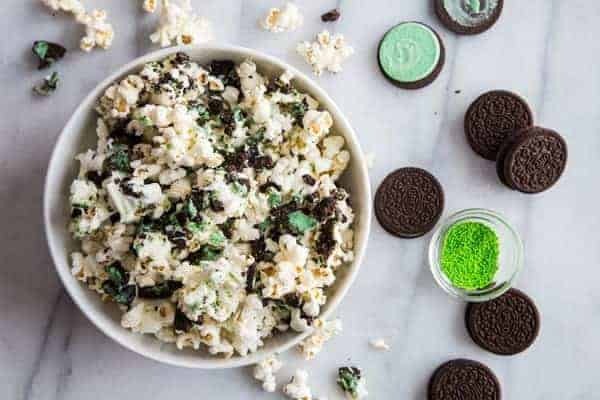 Drizzle half of the melted candy over the popcorn and sprinkle with half of the Oreo crumbs. Use a spoon to gently toss mixture together. Drizzle with remaining melted candy wafers and sprinkle with remaining Oreos. Refrigerate for 10 minutes to set the melted candy. Break popcorn into pieces and store in an airtight container for up to 3 days. What a cute and fun snack. I bet your kiddos were loving this and I think it would be perfect for Saint Paddy’s day. This is amazing!! Popcorn has got to be one of my all time favourite foods! Must give this a go!! While this popcorn looks great, why are you using white candy wafers rather than white chocolate? Wouldn’t the flavor be soooo much better with white chocolate? Yes, you can absolutely use white chocolate in place of the wafers if you prefer. It would be delicious, for sure! Melting white chocolate can sometimes be tricky to do without scorching, so I wrote the recipe the melting wafers simply for ease of preparation. I hope that helps! Thanks for stopping by! Oh, wow. I made some mint chocolate chip popcorn at Christmas and it was a huge hit. I’ll have to try making this! This popcorn is right up my alley! When you instruct to pop the popcorn in an air popper, could a microwave suffice? If you have a plain variety of microwave popcorn, it should work. Thanks for stopping by. You can also pop it on the stove top. Microwave popcorn usually has flavorings added, if you have a plain variety though, it could work. I hope this helps.